Sixth grade teacher Roxanne Parker was thinking thematically - relating our all-school Water theme to Black History Month. She compiled an 18-page document focused on the water-related discoveries, inventions, and activism of African Americans past and present. Featured activists ranged from Harriet Tubman – who led three ships up the Combahee River, going from plantation to plantation and freeing more than 750 slaves – to Flint, MI’s Mari Copeny - who in 2016 at age 8 wrote a powerful letter to President Obama on behalf of Flint and its children, who could no longer drink from the tap, shower without their eyes burning, or even safely use a Slip ‘N Slide. 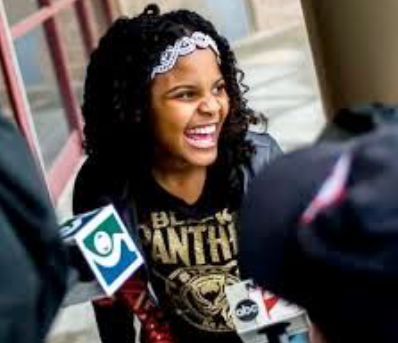 Preteen Mari Copeny, who help turn our nation’s attention to Flint’s water crisis. Several Family Circles will be discussing these and other notable African Americans whose efforts have made significant differences in our nation – and in our nation’s conversations about protecting our water resources. Newer PostSupport the 8th Grade Yearbook!